After being on the bus for a few hours the day before, it was great to wake up, have breakfast, and take a walk through what was now 'our' village. 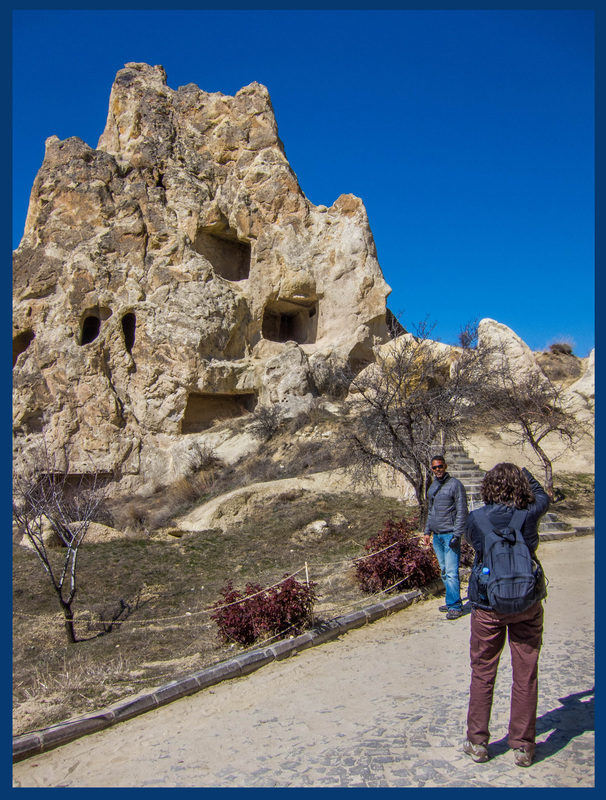 It's a small village and was a good base for the day trips we made while in Cappadocia. Here we have the corner market, rather makeshift but meeting the 'snack needs' of villagers. 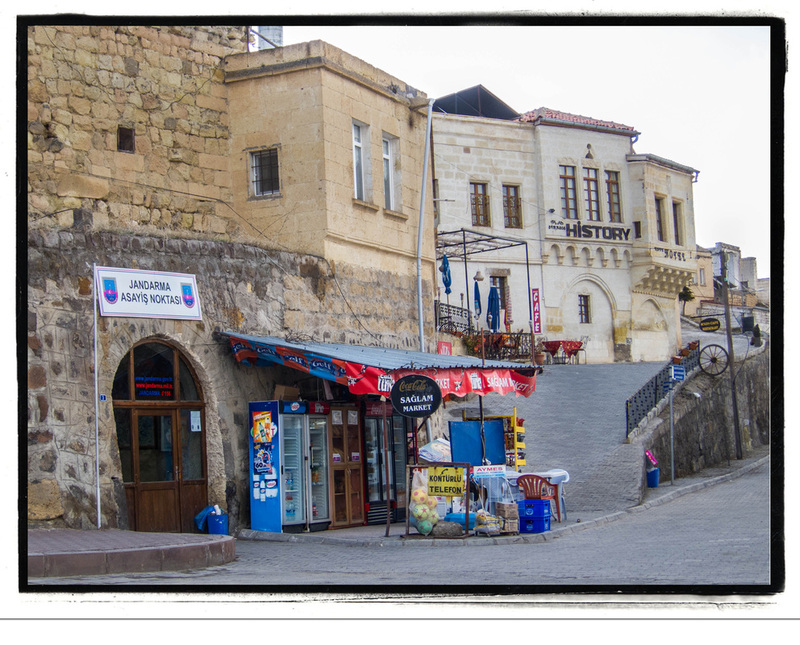 There's a small private university here so Müstafapaşa also has a student population as well. 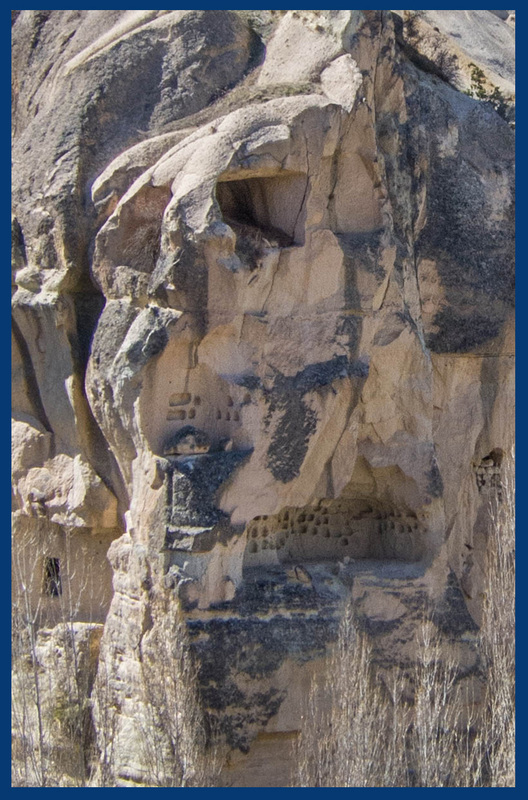 This is an example of how Cappadocia's soft rock formations have been carved into rooms. While walking, we were able to meet a few of the local villagers. This mason is cutting stone for paving, probably the same way as his ancestors over centuries. Watching him felt like I was looking back in time. This local woman keeps busy raising 3 children and working as a sub-contractor weaving rugs. 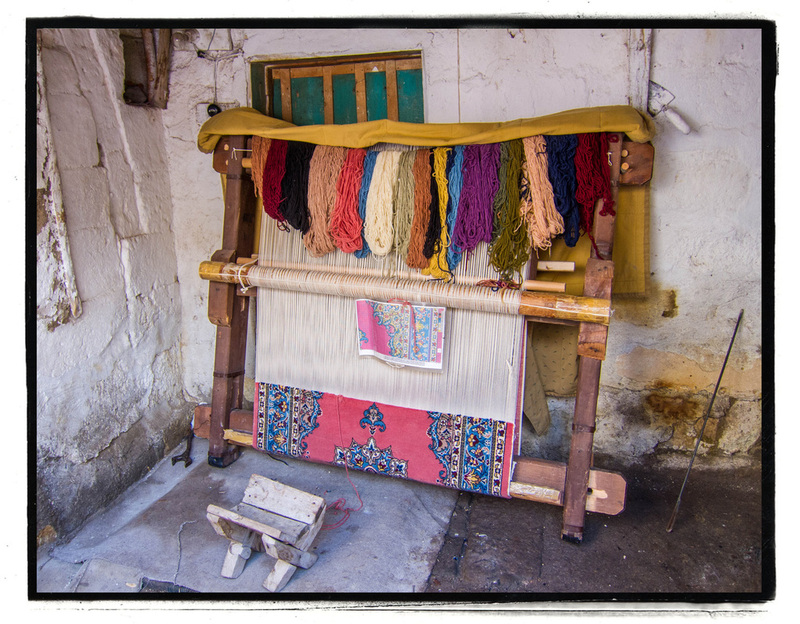 A loom was set up in her patio with its rug in progress. As we walked, we met several enterprising vendors. 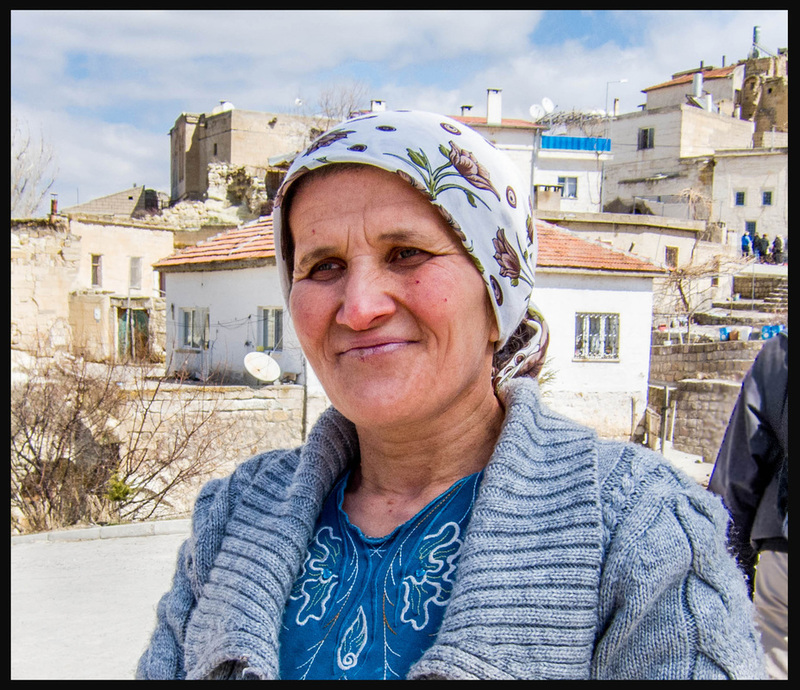 This woman was selling hand-made lace scarves. She did pretty well with us. I think every woman in our group bought one. I was fascinated with the colors and textures used in the village that offset the neutral browns and tans of the building stones. My favorite color, turquoise, must be the favorite of others too. 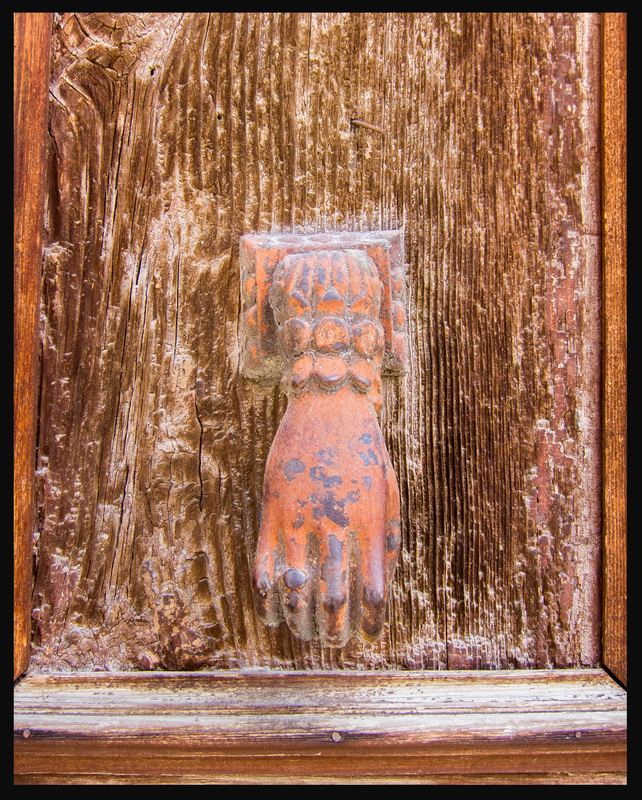 Close up of hardware on a door in the village. The hillside with its carved rooms. 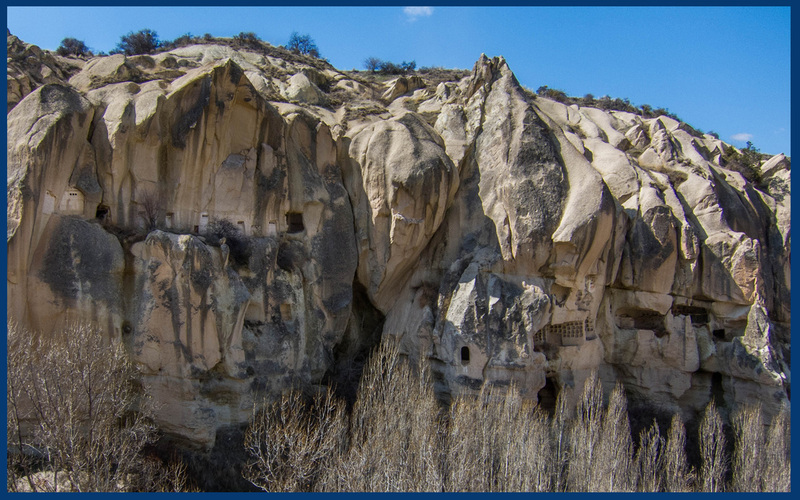 In the afternoon, we traveled to Göreme, an open-air museum of rooms cut out of rock. Primarily used as a church, there are still some writing and symbols to be seen. During our free time, Fred and I explored and tried to capture the spirit of the place. 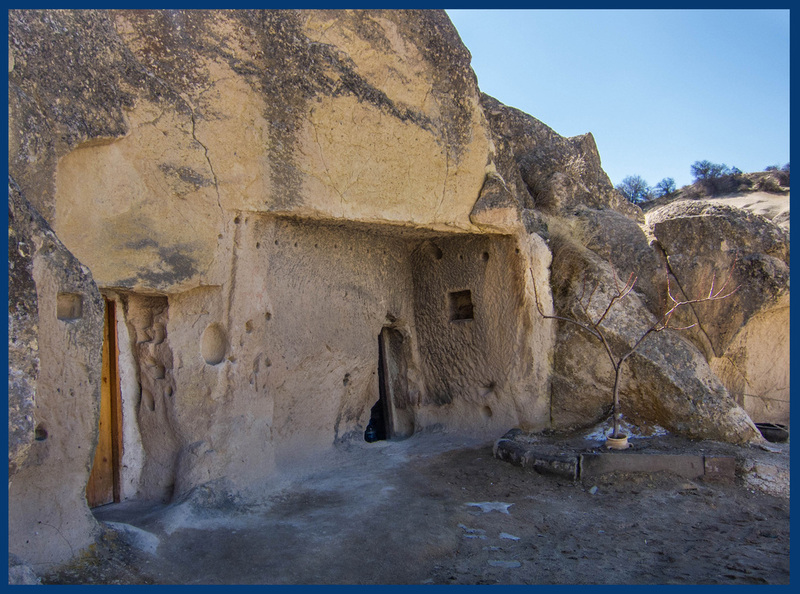 What was it like to be living in these caves centuries ago? A photo of Bianca taking a photo of Stephen. Bet no one's ever thought to do that before-Ha! 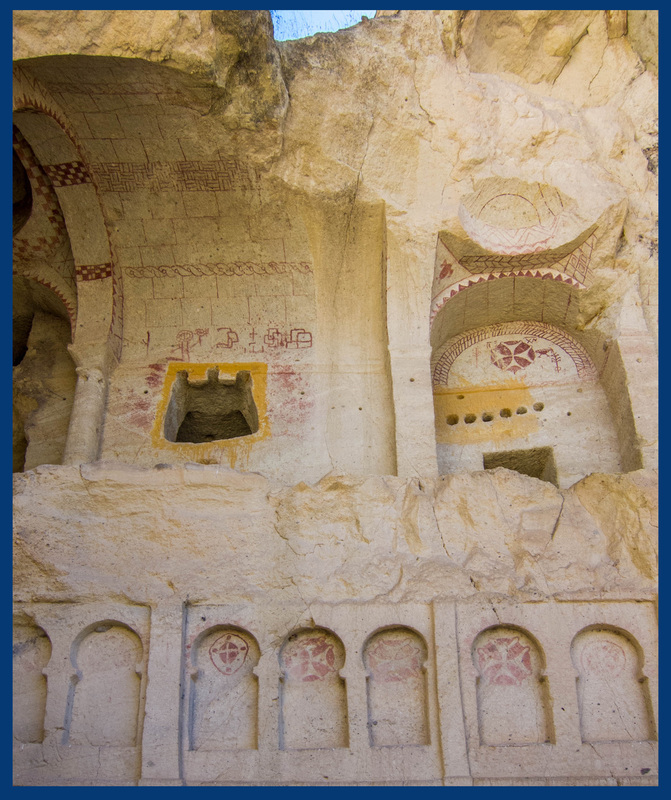 Religious writing and symbols from when these caves were used as a church can still be seen. This setting could have looked the same 2000 years ago. The way to compliment a meal is to hold up your hand with all fingers together. Wan and Wan Lin demonstrate this below. 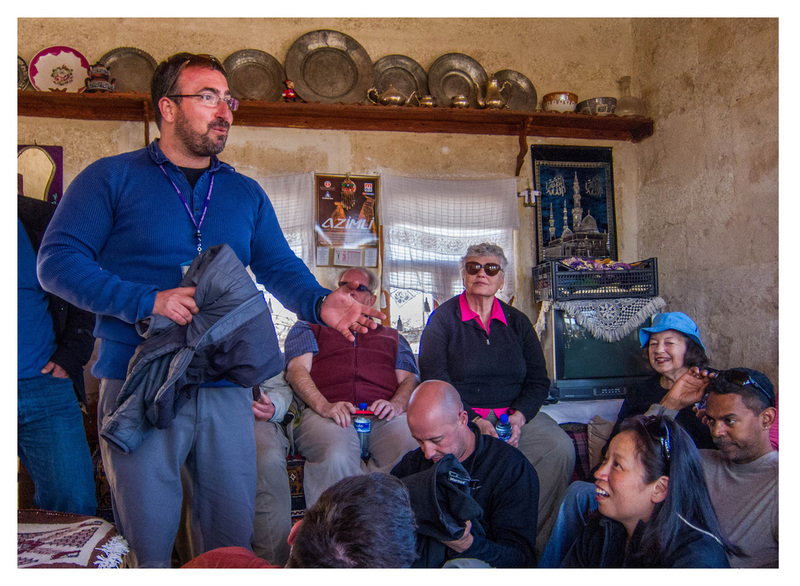 After lunch, our group was able to ask questions about Turkish life and culture, with Mert as our interpreter. We asked about politics, home life, raising children, and marriage. We got a few good laughs in too. 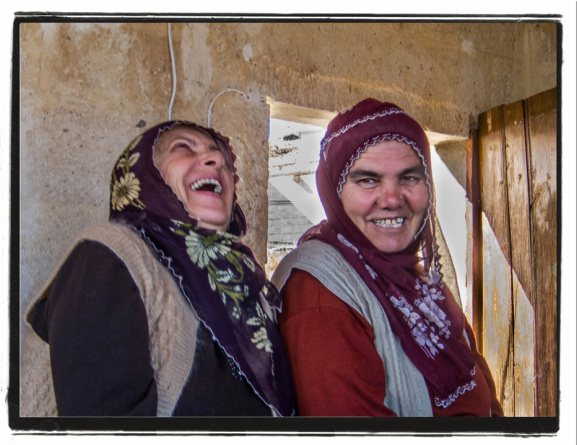 Laughter - a universal language! After lunch, our group stopped in at a carpet co-op. This co-op makes it possible for local weavers to produce and sell their rugs and for buyers to know that they're buying high-quality goods at a fair price. 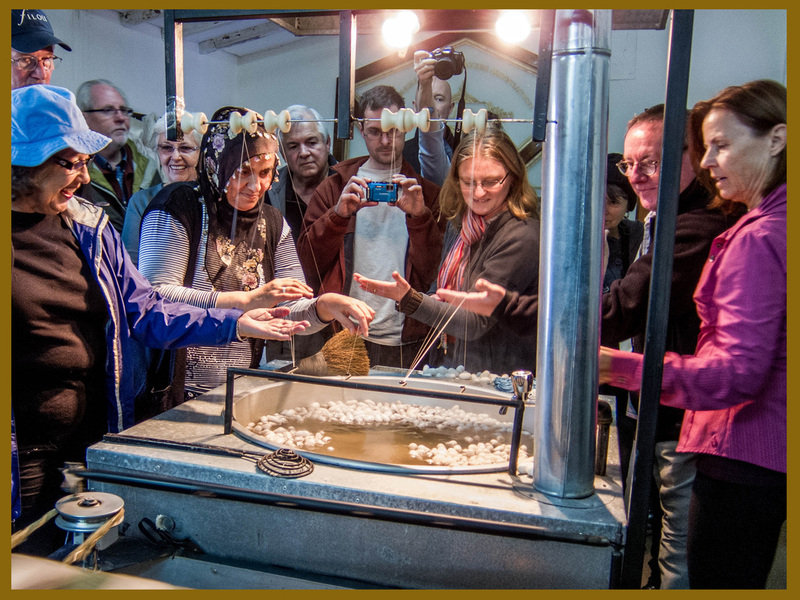 The first part of our visit included a tour and an education on the skill and time needed to produce a Turkish rug. 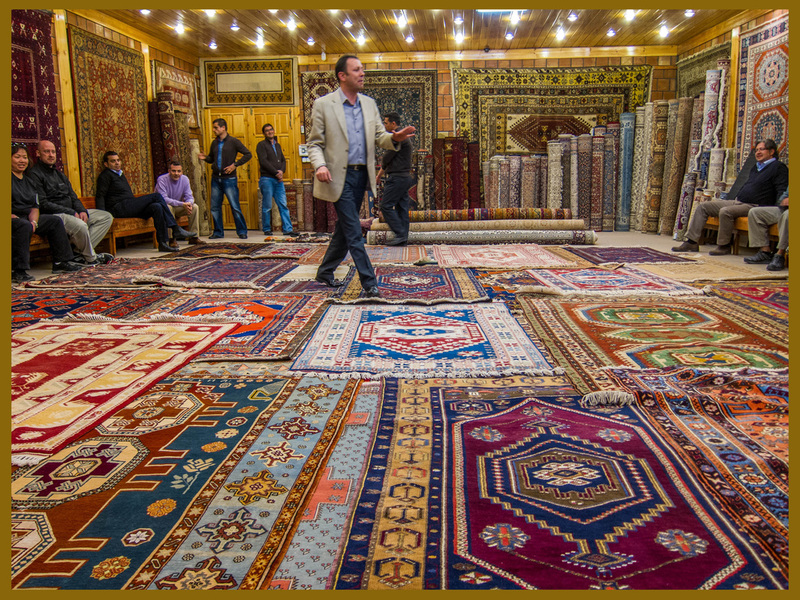 After our tutorial, we were given the opportunity to see a number of exquisite rugs in a large array of sizes and colors. After learning more of the skill and time it takes to make these rugs, it was hard to resist buying. Since my favorite rug's pricetag was 35K, I needed to pass. Georgene has the right idea. 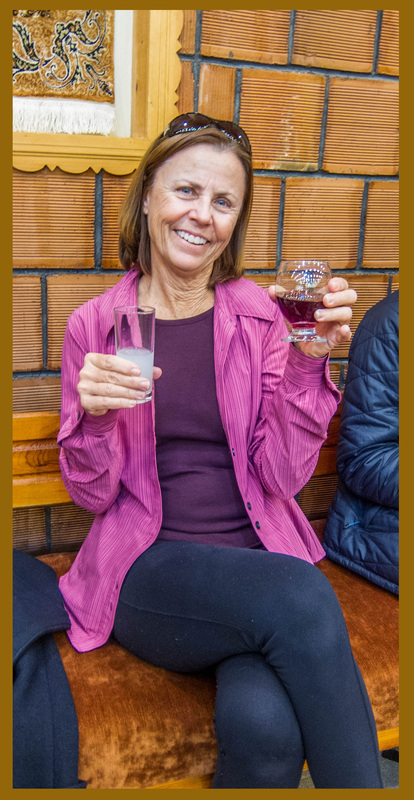 Tea in one hand, Raki in the other (Raki is a licorice-tasting drink with just a 'little' alcohol).